The Naked Gun slot is of course a game based around the series of Naked Gun comedy movies from 1988 to 1994 starring Leslie Nielsen, Priscilla Presley and Ricardo Montalban. 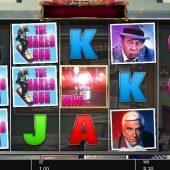 In those slapstick comedy films Nielsen played the hapless detective Frank Drebin, who has a starring role in this slot. The reels are transparent and are set on a background of Drebin's Police office and you have the comedic jazzy soundtrack from the movies as a background and like most Blueprint slots we should get a decent array of features. 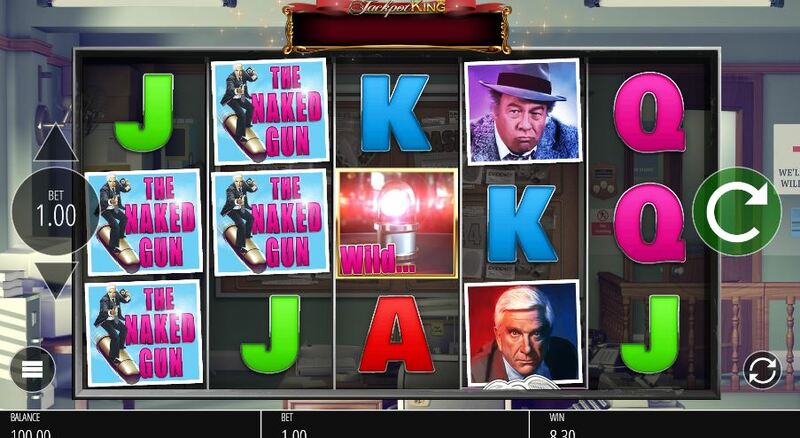 So will Naked Gun slot have you laughing - all the way to the bank? It's not Blueprint's first trademark game; we've had Ted, Peter Pan, Worms and Viz to name a few and like those we get 20 pay lines over 5 reels of 3 rows. (It is also a 'Jackpot King' game so may have a pooled progressive game triggered randomly with Crown symbols overlaid on the reels of which you need five if applicable). The premium symbols appear stacked except the Police Light Wild which is the best pay at 25x stake for a 5-of-a-kind win. This is followed by the game logo at 20x then Drebin and Jane Spencer at 10x bet and the other two characters paying 5x bet for the 5. The remaining icons are the card values and they can appear stacked too, with pays of either 4 or 2x stake for all 5. There are Police badge scatters on all reels and we need 3 for the game to select one of its 5 different free spins bonuses for us. Like with Ted and other Blueprint games, extra scatters can be randomly added to the reels on any spin for a better chance of a bonus trigger. You may also see the other random in-play feature of Roaming Wild - If you get 3 Wilds in view a police car appears on the screen so Wilds can then roam. As they roam extra wilds will be added to the reels. When the reels land, if another Wild lands in view, this will cause another re-spin of the reels after the wins are paid. This continues until no more new wilds are created. There are 4 different bonuses of which the better ones are triggered by 4 or 5 scatters, but if you only land 3 scatters then you do get the opportunity to gamble your feature. However be aware you'll be palmed-off with a coin value if you lose! Home Run Spins Bonus - When the Wild lands it pays as normal but then becomes a 'sticky' roaming Wild by remaining for subsequent spins and moving to a random position. This occurs for all new Wilds that land in the spins. Stake Out Free Spins - When the Wild lands it pays as normal but then becomes a 'sticky' roaming Wild by remaining for subsequent spins and moving to a random position. This occurs for all new Wilds that land in the spin, as above, but this time when 2 Wilds land on the same reel position they become a 2x - 5x multiplier in any wins they form. On the Edge Free Spins - same as above, but when the Wilds overlap they will become expanding Wilds plus you get an extra row and 40 pay lines. Crime Scene Free Spins - same as On The Edge Free Spins but the expanding Wilds will become multipliers to at 2x - 5x again with an extra row and 40 pay lines. None of these can retrigger and 4-scatter triggers will award the Stake Out Free Spins and 5 scatters the highest one, the Crime Scene Free Spins.